Thailand is beginning a year of mourning for King Bhumibol. The rules surrounding the period are strict and include a 30-day restriction on festivities, such as parties and drinking alcohol, which could slow down tourism arrivals. Some locals, such as Mantuporn Sakanawat, have expressed concern about the economic effects of the monarch’s death. The stock market has begun to recover following the king’s death, which experts say could be due to a period of calm and stability nationwide after his passing. But analysts predict a possible dip in the markets in the coming months as investors keep an eye on how politically stable Thailand remains. Prem Tinsulanonda, 96, has been appointed regent after the Crown Prince refused to take up the throne immediately. The Thai military government has warned people not to use the king’s death as an excuse to stir up political chaos and has said a general election in 2017 is still on the cards. In the meantime, many Thais will wear black as a sign of respect for King Bhumibol. 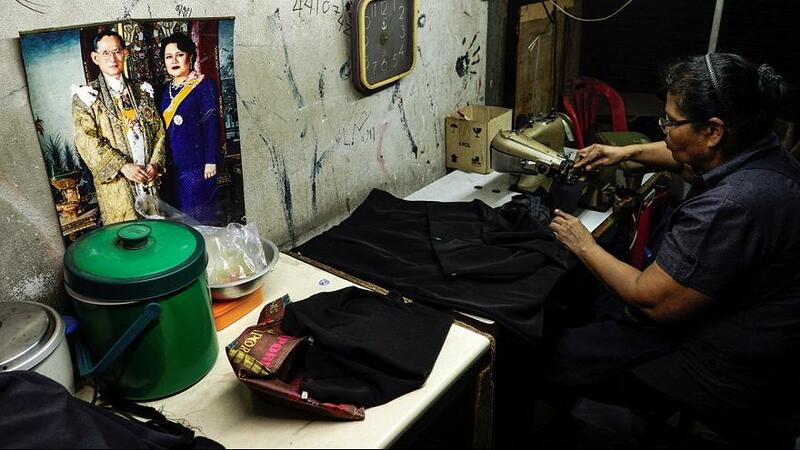 A swamp in demand and diminishing supply have led to the opening of pop-up clothes-dyeing centres, to turn old garments into mourning-appropriate clothing.